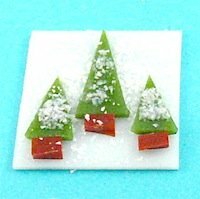 Fused glass Christmas trees made from a few pieces of fusing glass and contour fused in a glass fusing kiln. 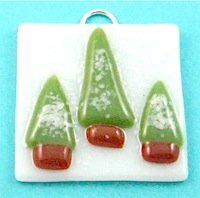 This simply designed Christmas ornament can be made in a number of ways with the fusing glass colors being changed and other decorations added. Pieces of scrap glass are ideal for making these trees. Fine white glass frit is scattered over the trees to give the appearance of snow. Silver or gold mica can be sprinkled over the trees for a sparkly finish. The sample trees are very small but can be easily increased to a larger size. Base glass 1 7/8" x 1 7/8"
Large tree 1 1/4" x 5/8"
Tree trunk 7/16" x 1/4"
Small tree 7/8" x 9/16"
Tree trunk 3/8"" x 1/4"
As this is a small piece of art glass, it can be bought up to contour fusing temperature very quickly. On completion of contour fusing switch off kiln and allow glass to cool to room temperature. A jump ring has been epoxied to the rear of the fused glass so that the ornament can be hung by a ribbon. The center tree can be moved lower on the base glass so that a hole can be drilled through the art glass instead of gluing a ring to the back of the glass.